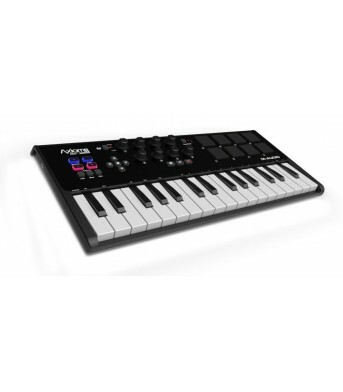 M-Audio Axiom AIR Mini 32 USB Keyboard Shatter barriers with the Axiom AIR Mini 32 from M-Audio. Un..
70 Watts of Crystal Clear Output for Clean Mixes When you snag a pair of M-Audio BX5 Carbon active .. Affordable Monitors for Professional Applications Loaded with 8-inch woofers, M-Audio BX8 Carbon ac..
M-Audio Code 25 USB Keyboard Controller The M-Audio Code 25 is a premium, versatile keyboard contro..
M-Audio Code 49 USB MIDI Keyboard The M-Audio Code 49 is a premium, versatile keyboard cont..
M-Audio Code 61 USB Keyboard Controller The M-Audio Code 61 is a premium, versatile keyboard contro..
M-Audio CTRL49 USB MIDI Keyboard CREATE, TRANSFORM, REMIX and go LIVE with the best semi-weighted s..